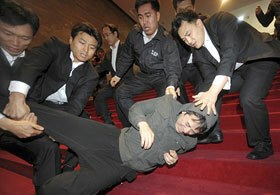 ‘South Korea: Barrack-room brawls; A low moment in the country’s party towards a mature democracy’, © The Economist, Vol. 390, No. 8613, January 10-16th, 2009. In the midst of a global economic turmoil, Northeast Asia’s leaders struggle to find an exit from the crisis. Domestic approval rates show that the incumbents, President Lee Myung-bak of South Korea has a long way to go. South Korea has transformed from a dictatorial state to a democratic regime over the past decades. It being such a rare case accompanied by economic development, South Korea’s progress in democratization and gradual change of regimes since the early 1990s were noted “fairly remarkable”. However, after the 1997 Asian Financial Crisis, corruption of bureaucrats and escalation to bankruptcy led the general public to political distrust. First, political apathy overflowed as the South Korean economy staggered towards the end of the year in 2008, polls showed the declining public support for President Lee Myung-bak. Not so surprisingly, the South Korean government in present day demonstrates the least acceptable form of democratic ruling in since its transformation. Featured in this week’s <The Economist> on Asia were the low moments of democracy captured in an unpleasant photo of the ruling and opposition parties wrestling at the Grand National Party for passing the 95 relevant bills. Though pictures of this kind have existed as long as one could recall even in the aftermath of Korea’s democratization, the candle protests that first began as an anti-U.S. movement during the Roh Moo-hyun administration seem to be completely meaningless. From a critical view, candle protests seem to have become a somewhat meaningless tradition whenever there is a public discontent with domestic or foreign policies. Moreover, a great portion of the protesters seem to be merely ‘joining the crowd’ without a thorough review of the policies given. This does not mean that the incumbents are not to blame at all. What the current leader of Korea lacks is the will to communicate with the people and the leadership to take charge. Support rates for President Lee prove the results of his self-driven, unilateral policies; polls revealed that rates plummeted down to 20% after the global economic crisis affected Korea without exception. The people don’t want to listen, and neither does the president. The only way to express one’s view is to write in anonymous names in the cyber world or get out on the streets with candles in their hands. In response, the administration is out to get the nonconformists. What a show. ‘South Korea: Barrack-room brawls; A low moment in the country’s party towards a mature democracy’, The Economist, Volume 390, Number 8613, January 10-16th, 2009.